Hello all! I can't believe it's the last day of 2012 already. I won't say it was a bad year, it brought some pretty awesome moments for me, and most of it was spent amidst our extensive family, and when you're part of a nuclear one, nothing can top that. Socially and politically, this year was an eye-opener. Most new year celebrations have been put off as the nation mourns the death of its brave-heart. "I want to live," the girl had told her brother and mother when they first met her on December 19, three days after she was brutally gang-raped and assaulted in a moving bus in south Delhi. You may be no more, but your spirit and your courage awaken us to act, to speak out, to fight for a country where every girl, every woman is safe in the truest sense of the world. The government may have failed us, but I pray that the dawn of a new year shall bring with itself better sense and compassion for those that have been elected as our representatives. Intellectual innocence can no longer be an excuse for the dearth of laws for the safety of womankind. And while every news bulletin brought gloomy news continuously, here are few things that brought me joy. 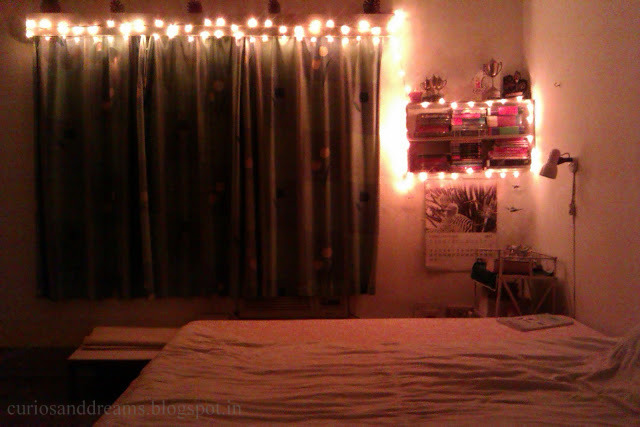 Cheap fairy lights in my bedroom- I love how this gives my haven a warm glow. Most nights, I just curl up with a blanket and lie awake gazing at the lights, till my eyes unfocus them to a pretty bokeh. Totally magical. Getting adventurous with 5 blank canvases- There is a tiny element of rebel in following summer trends in the middle of winter. 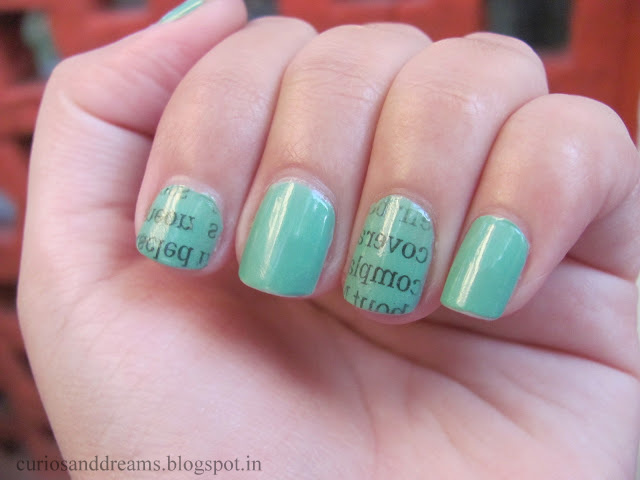 So I painted my nails with a cool mint shade from Colorama, and tried my hand at newspaper nails. Excuse the uneven application please. 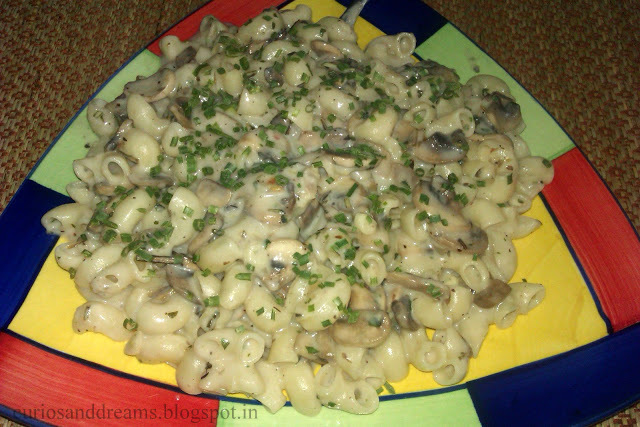 Pasta with mushrooms- This was an experiment, and I guess healthy because I omitted cream and cheese. Its tasted fine nonetheless, probably because of all the herbs. Looking forward to making it again as even Papa liked it, which is definitely a feather in my cap, hehehe! 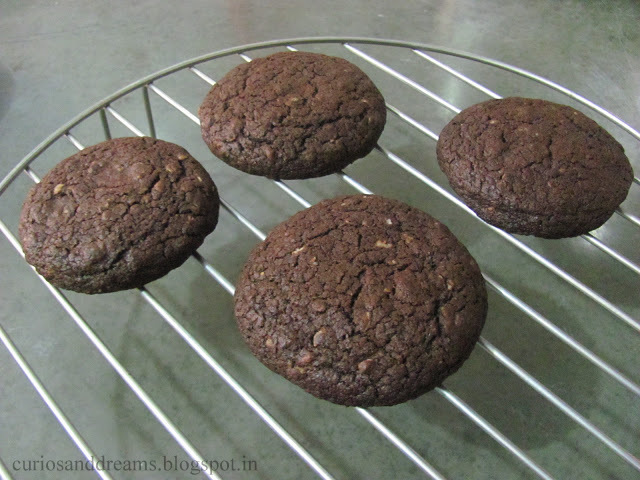 Recipe will be available on C&D soon. 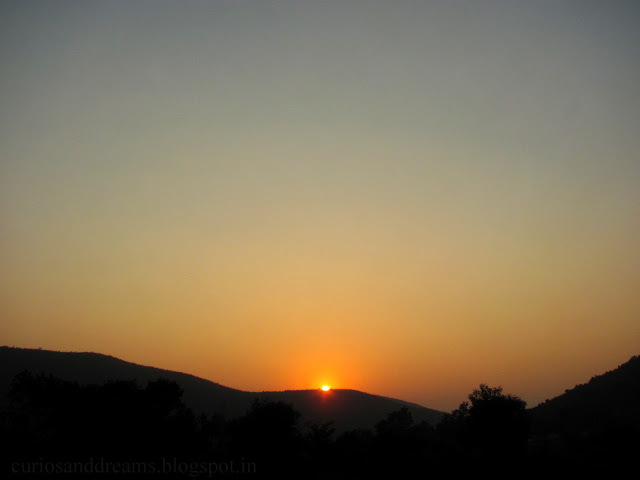 Sunsets- This particular one was captured as we returned from a get-together via the highway. My camera didn't quite capture its beauty, but the view was phenomenal. The hills you see here are a part of the Dalma range, at the foothills of which my hometown is nestled.